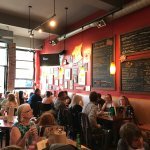 Dinner Restaurants in South Pandosy - K.L.O. One of my favourite places in Kelowna! Really great location, great food, and great staff. 10/10 would recommend anyone to check this place out! The sde dishes were v small . 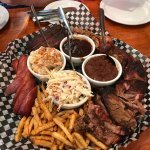 We shared full platter of ribs at $30. Total. Had more than enough ribs to take some home. Appreciated that Sauce was on the side as wasnt sure of flavor. It was ok.. some ribs were too chewy and not tender enough to eat. 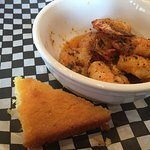 The cornbread was quite dry and crumbly.. not keen to return. I have been many times. I bring clients and my family here. Authentic Southern BBQ. Andre and his staff are friendly and knowledgeable. 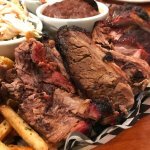 My favourites are the brisket (especially as a salad), the ribs (firm and smoky), and killer Bourbon and local cocktail list! We pride ourselves on consistently great food & service and really appreciate your patronage. New bourbons coming all the time. Make sure to try the local BRBN from Okanagan Spirits on your next visit. 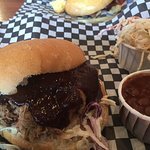 I went in expecting amazing BBQ as a dedicated BBQ joint your stuff should rock. I ordered the ribs, which should be the pride of every BBQ joint. The portion size was excellent it comes with corn bread, coleslaw, fries, and baked beans. The ribs were cooked to fall of the bone consistency which for me is pandering to the masses. A good rib is to the tooth a little more pull and not mushy. My ribs still had the membrane intact underneath the rib. Any beginner BBQ enthusiast knows that is the first thing you remove. The taste- well bland. No smoke ring, no smoke flavour, and the rub was unremarkable. The BBQ sauce was served on the side, if you are going to serve sauce it should be on the rib and caramelized on a hot charcoal grill. 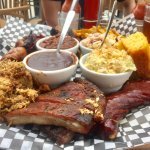 The baked beans had more smoke flavour than the ribs! The slaw was so bitter it was inedible. Cleanliness is questionable. 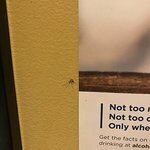 When there is a squashed mosquito on the wall of the washroom in February it does not breed confidence. Thank you for your great review - we really appreciate your positive feedback on our food and service. Yes, we are Keto friendly as well as Paleo-friendly. We are also Celiac-friendly - you name it - we're just downright friendly! 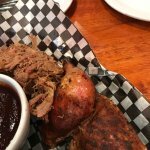 Been to Memphis Blues Barbeque House? Share your experiences!